IC offers many short-term study abroad options during school breaks. 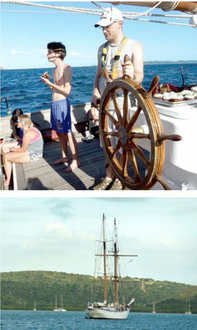 Last winter, 16 IC students learned to steer a ship with only the sun and the stars as their guide. They spent more than a week last January in the Caribbean, conducting scientific research on a 134-foot sailboat. As part of a capstone biology class, the students and four professors partnered with the Sea Education Association (SEA) Semester program to learn how to take scientific measurements and perform research at sea. The students took ocean water measurements, collected plankton specimens, and even learned celestial navigation, calculating the latitude and longitude of the ship based on the positions of the stars and sun. The college hopes to offer a similar course in 2016.